The finale of the vibrant awards night was the award for the art exhibition competition entitled “Metamorphism”. As a similar competition was run in Adelaide successfully, the first of its kind in Queensland involved students from Queensland University of Technology, University of Queensland, Bond and Griffith University. 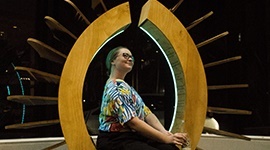 Participants were requested to design a one meter wide by two-meter-tall art installation that would be exhibited at Queensland University of Technology in Gold Coast. The design was to consider how the essence of the Gold Coast has transformed over time into its current state. The participating universities invited colleagues to make a team that would work on their proposal for the next 7 weeks. The teams were encouraged to work with university staff to inspire a valuable collaborative process. Queensland University of Technology, assisted by their Design Fabrication Lab constructed “WAVE” which won the people’s choice award to complete a fun and fulfilling experience. Each week was a new lesson for the students who worked hard to realise their vision despite commitments to an ongoing semester. The opportunity to build an entity that people could interact will make this experience resonate in our creative minds and ultimately benefit our approach to design in the future.